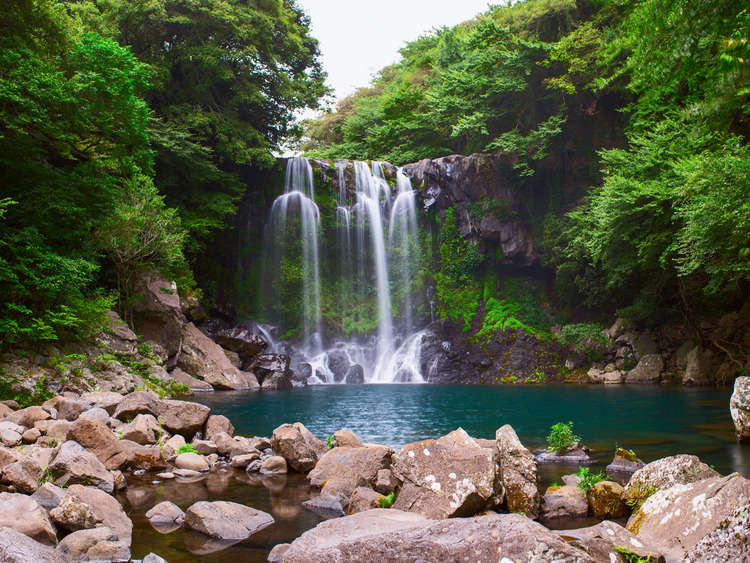 • We cross the island to get to the Cheonjeyeon waterfalls, made up of three separate cascades generating from inside a cave carved out in a cliff and creating a spectacular splash into the sea. • We admire the first cascade into the 'Pool of Gods'**, a small picturesque lake whose name derives from the fact that people believed that seven nymphs would come down to bathe here in the evenings. • We walk through the forest among rare examples of local flora and climb as far as Seonimgyo Bridge with the seven nymphs carved on its side. This is also the location of the octagonal Cheonjeru tower with its lovely wall painting dedicated again to the legend of the seven nymphs. • Our next stop is the Yakcheonsa Buddhist temple, an imposing building over 30 metres tall and richly decorated with three different amazing pagoda roofs. • Upon entering the temple, we are welcomed by a colossal Vairocana Buddha statue almost 5 metres tall, the largest in Korea. The walls to the right and to the left are sculpted with portraits of Buddha and the temple is also home to a gigantic bell weighing 18 tons. • After our visit, invigorated by the peaceful and strong spirituality that emanates from this place, we return to Jeju City.